This work describes BOINC-based Desktop Grid implementation of adaptive task scheduling algorithm for virtual drug screening. The algorithm bases on a game-theoretical mathematical model where computing nodes act as players. The model allows to adjust the balance between the results retrieval rate and the search space coverage. We present the developed scheduling algorithm for BOINC-based Desktop Grid and evaluate its performance by simulations. 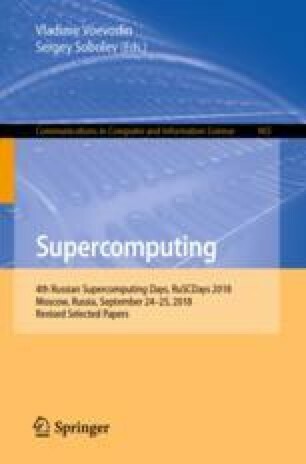 Experimental analysis shows that the proposed scheduling algorithm allows to adjust the results retrieval rate and the search space coverage in a flexible way so as to reach the maximal efficiency of a BOINC-based Desktop Grid. This work was supported by the Russian Foundation of Basic Research, projects 18-07-00628 and 18-37-00094.